Eswaybar Used about 3 times now and it was great. 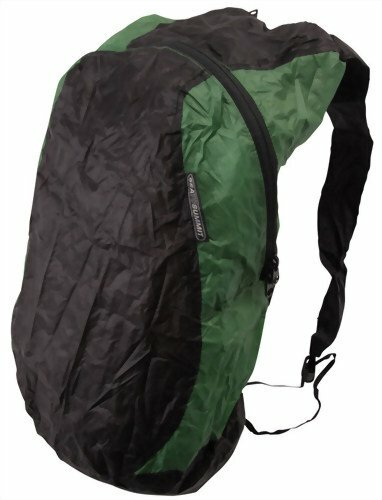 This is a good pack to pack in to the backcountry set up a camp hq and bag a few trails and peaks. I always hated lugging a 2# day pack in to the backcountry. This thing worked good for up to about 8-10 pounds. John the Traveler This is the perfect knapsack to carry whenever or wherever you find yourself unexpectedly needing to carry stuff. It's so very tiny when stowed, but tough and extremely light when in use. I even took it to Morocco and found myself using it to carry the stuff I picked up at a village market. It was comfortable with about 10 or 12 pounds. I know keep it in the glove box of my Vespa for that unplanned trip to the library or grocery store when I need a knapsack. MattBH I haven't done extensive carrying of stuff with this, but so far it's great. It packs down to the size of about a Dixie Cup. When flipped into a backpack, it's actually holds a fair bit. Without any padding or structure, you have to take more care than usual to create a comfortable load, but that's to be expected. So far it seems durable, but again, I've only had it a short time. Bill I haven't done extensive carrying of stuff with this, but so far it's great. It packs down to the size of about a Dixie Cup. When flipped into a backpack, it's actually holds a fair bit. Without any padding or structure, you have to take more care than usual to create a comfortable load, but that's to be expected. So far it seems durable, but again, I've only had it a short time. Steve Traveled to Argentina for 10 days of business, had to pack light. 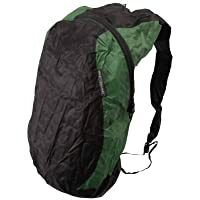 This day pack is so compact, takes up no space in carry-on luggage, yet unfolds to provide sufficient space for a day's worth of adventure (spare jacket, lunch, water bottle). Worked well on a weekend day hike. Very light but durable. Highly recommended.